Capt. 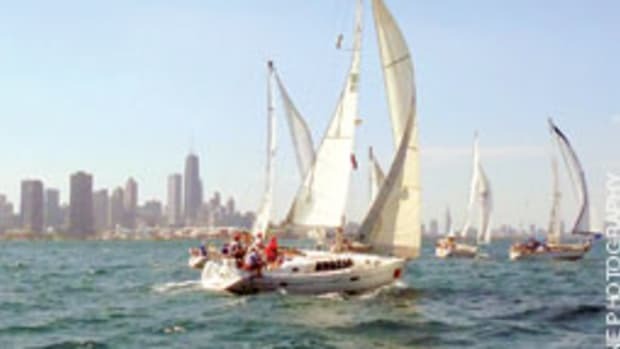 Kirk Ezell and first mate Dana Lee “Rabbitt” Ramsden were about 200 miles off the Caribbean coast aboard Blue Chip, a 1996 Beneteau 50. The wind was going strong and seas were swelling to nearly 20 feet — and Ezell and Ramsden were waiting for rescue. “[The water] came in faster than we could believe,” says Ramsden, who lives in Portsmouth, Va.
Three days earlier — when the pair left Cartagena, Colombia, on Dec. 23 — there was certainly no hint of any problem. But now — even with the water below at about shoulder level — the pair still couldn’t contemplate how much worse things were going to get. Soon Ezell and Ramsden would watch helplessly as the bottom fell out of their fully loaded Zodiac, and their survival essentials floated away. Ramsden — who grew up in Yonkers, N.Y. — began her professional boating career aboard a commercial fishing boat, Teri Nova, scalloping out of Provincetown, Mass. 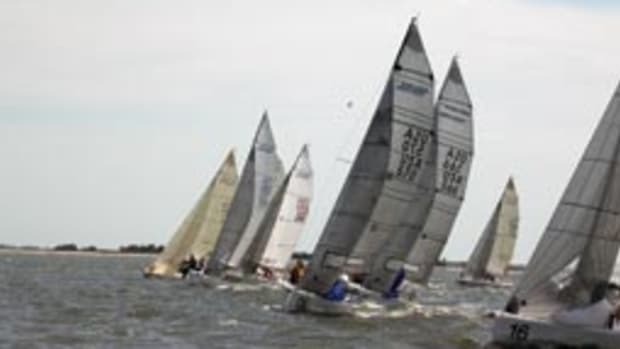 But it wasn’t until about eight years ago that she discovered her love for sailing. For the last two years, Ramsden has lived in Portsmouth, where she also details boats. “I have a lot of good customers here, but I always prefer to deliver boats,” she says. 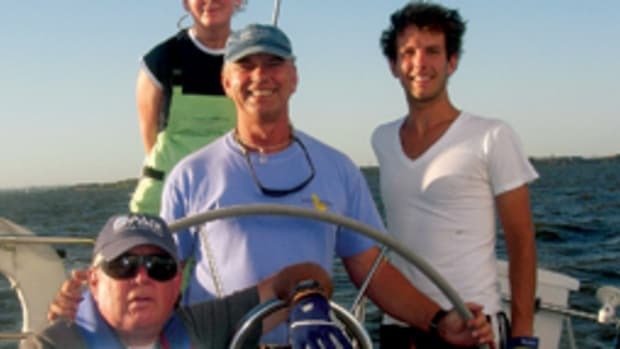 Newport, R.I.-based Blue Chip was Ramsden’s first crewing experience. She had spent the last eight years looking after Blue Chip with its four staterooms and crew quarters in the bow. 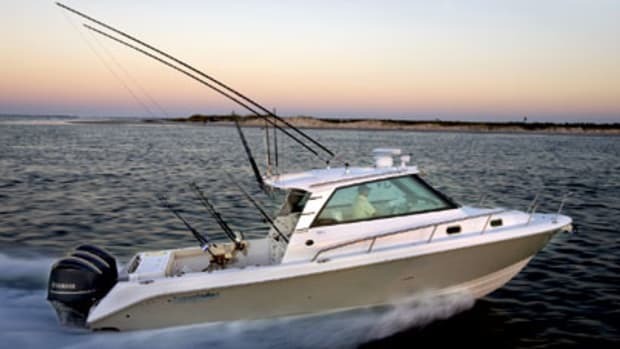 “That was one of the reasons it was so sad to lose that boat. We had a lot of miles together,” she says. 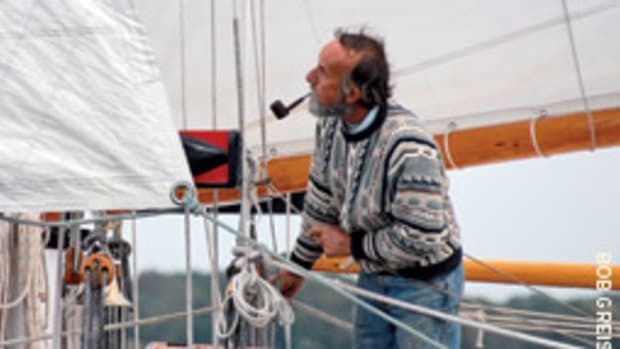 As Blue Chip’s last voyage began, Ramsden helped pilot the Beneteau from Rhode Island to Cartagena with the previous captain. That captain had to return home because of family issues, and Ezell was hired to captain Blue Chip the 504 nautical miles from Cartagena to Montego Bay, Jamaica. Ezell has been a sailor for years, a competent captain, he says, who spent four years in the Coast Guard. Eight years ago, he sailed into Cartagena and made it his home. Before leaving Cartagena, Ezell says he thoroughly inspected Blue Chip. The boat recently had her bottom redone, Ramsden confirms. “She was treated with kid gloves,” she says. The vessel was in tip-top shape, though the inflatable dingy had a slow leak in the bow and had to be pumped about every two hours, she says. There was nothing to report when they left Cartagena at 11 a.m. Dec. 23, 2008, save some bad weather they set east to avoid, says Ezell. While on Dec. 24 Ezell and Ramsden located a leak coming from some joiner work, a five-minute pumpout every hour or so kept the problem under control, Ezell says. Christmas Day, too, passed without event. 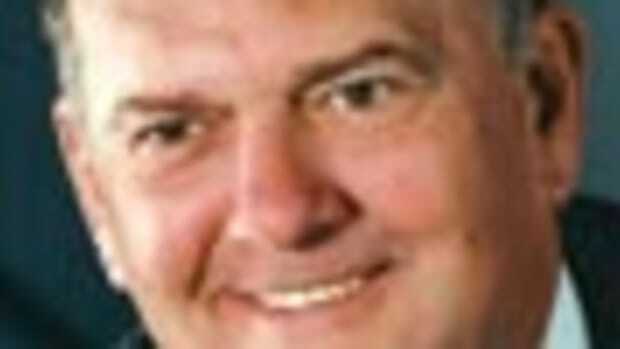 Late that night, Ramsden alerted the captain to a freighter that was uncomfortably close to Blue Chip. That was about 11:45 p.m., she says. By 12:15 a.m. the next morning, something had gone wrong. “Dana discovered water to her ankles from the port aft head to the port forward stateroom,” Ezell says in an e-mail to Soundings. The pair began to bail, using everything available: buckets, portable hand pumps, electric pumps and sump pumps, Ezell reports. It had reached their knees within the hour. They activated the EPIRB, an ACR GlobalFix 406 MHz EPIRB with GPS. It was 1:49 a.m. Dec. 26 when the EPIRB was activated, according to OS1 Beth Werner, search-and-rescue controller of Coast Guard District 7. This proved to be the move that saves their lives. They were prepared to abandon ship, if it came to that, but Ezell and Ramsden had signed on to captain another man’s boat to Montego Bay, Jamaica, and the pair was determined to do everything they could to save the vessel. Ramsden and Ezell continued to look for a cause, even diving inside the boat in hopes of locating the source of the leak. They stopped when the engine became submerged, the water “filthy,” Ezell says, as fuel mixed with water inside the boat. After trying everything, they decided to prepare for evacuation. That was when they got the only functional life raft — a six-person, 13-foot Zodiac life raft from amidship, Ezell says, and attached it to the aft swim platform. They inflated the raft and began loading it with everything they thought they might need: passports, identification, charts, boat papers, cash and the EPIRB. As the water surged around them and continued to fill the ship, Ezell and Ramsden watched their possessions float away from the bottomless Zodiac. “Within five minutes, the raft was no longer together. The canopy came detached, the floor broke free and the floats separated in parts,” says Ezell. Everything of value “either sank or floated away,” including their EPIRB. Ramsden went down through a hatch to get spare aluminum floorboards stored below. The water was chest-high by that point, she says, and the floorboards were floating. They inflated what they could of the second raft, Ezell says, laying down the floorboards Ramsden retrieved even though they didn’t quite fit. Next came a strobe and man-overboard pole. The pair planned to tie together the floating tubes from the first raft — which held together the canopy, Ezell says — to the front of their new vessel for buoyancy. The pair collected anything they might be able to use, Ezell says — cushions, floating cans of food and beer and a spare bottle of rum, loading it all into their ad-hoc creation. “It had to be pumped up every 20 minutes,” Ezell says of the raft, a task they knew would become far more difficult should they have to abandon ship. “It wouldn’t have made it,” he says now, reflecting on the jury-rigged life raft. Ramsden and Ezell turned their attention back to Blue Chip and continued to bail. The boat was now more than half full of water, up to their shoulders. The pair knew it would be dangerous to return inside the boat; the interior woodworking had become detached and was floating around, Ezell says. They had been trying to contact help for hours, Ramsden reports, when they heard a plane overhead. What they saw was the Coast Guard’s HC-130 Hercules — a long-range surveillance and transport fixed-wing aircraft — dispatched from Clearwater, Fla.
Rescuers had located Blue Chip. It was 10:30 a.m. Dec. 26. The vessel was 105 nautical miles due south of Kingston, Jamaica, according to search-and-rescue controller Werner. Ezell credits the EPIRB with helping save his life. Werner agrees that the locator beacons are a vital search-and-rescue tool. “If they’re registered correctly, we can find people pretty quickly,” says Werner. 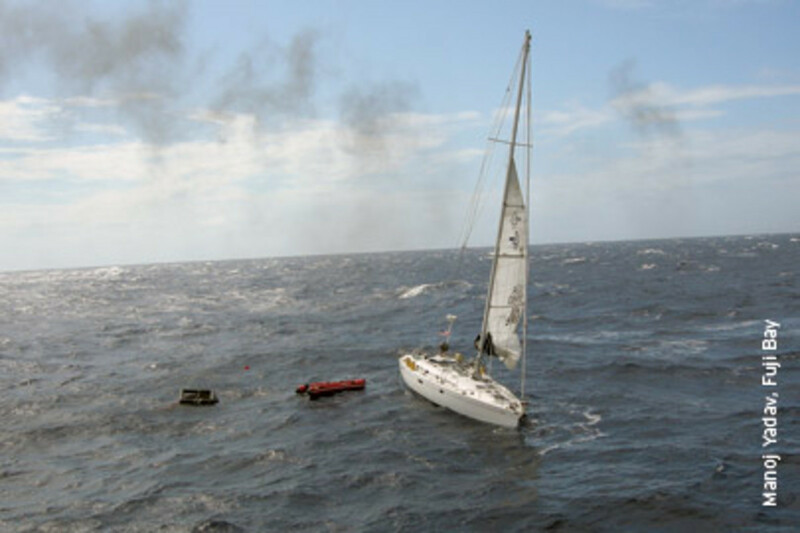 As the EPIRB had been properly registered, the Coast Guard was able to call Blue Chip’s owner and get confirmation that his vessel was off the coast of Jamaica, she says. While Ezell and Ramsden struggled to construct a life raft out of spare parts, the Coast Guard had been in contact with Jamaican officials and the Royal Bahamian Defense Force, looking for a nearby vessel to come to their rescue. Once he saw the aircraft, Ezell was able to make contact using a plastic-wrapped VHF he had secured in his foulies. 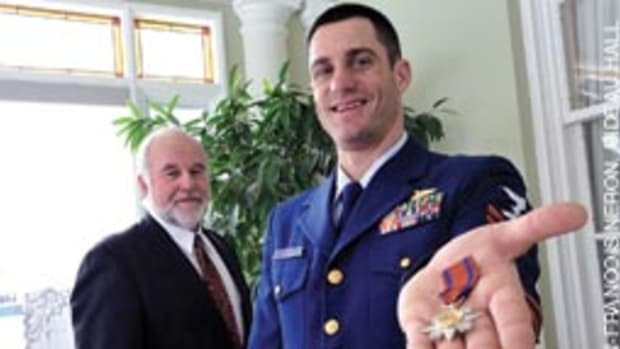 While the C-130 cannot hoist people, Werner says, Coast Guard personnel lowered a radio from the craft to ensure clear communication. According to Coast Guard reports, they also lowered an M-83, which contains three life rafts and two survival kits. Ezell says he only saw two life rafts drop within the vicinity of Blue Chip. “They made passes, a few feet off the water, checked the drift of us, then dropped the two rafts, stretching out a few hundred yards with their long buoyed trailing retrieving lines,” he says. Retrieving the dropped life rafts proved a feat, Ramsden says. “[We were] trying to get the life rafts that the C-130 had deployed, [but they were] not coming directly toward us,” she says. In order to retrieve the rafts, Ezell would have to steer into seas with a halfway submerged boat. Somehow, Ezell managed to make it happen, she says. “Basically he used the ocean to turn the boat around,” she says. “I had no jib, and a third reef in the main for stability, no steerage and water up to the first step … in the salon. I saw that we were going to pass close, but not upon the rafts, so [I] started to back the boat with the main to slow her down,” Ezell says. 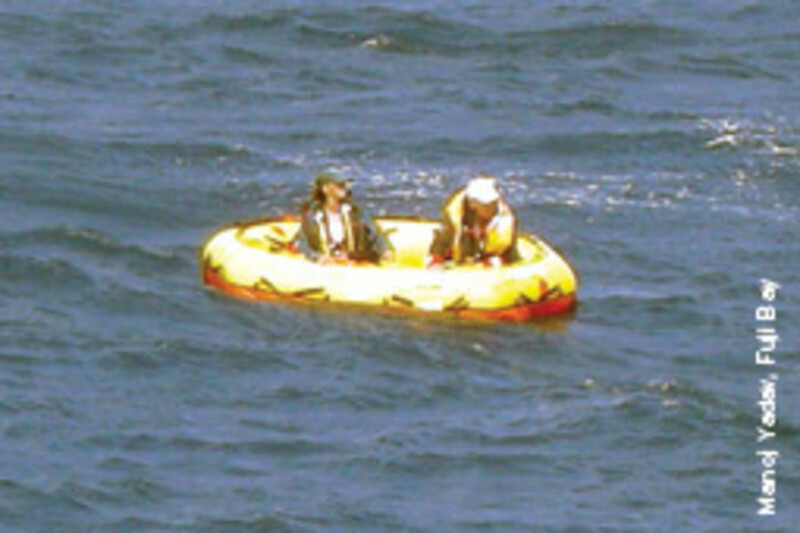 Ezell and Ramsden got hold of the last Coast Guard life raft by grabbing onto its trailing line and securing it, Ezell says. The Coast Guard instructed Ezell and Ramsden to board the raft in preparation for rescue by Fuji Bay, a 485-foot cargo ship sailing under a Liberian flag that was about 15 miles away. About 100 miles from the Jamaican coast, Ezell and Ramsden finally made the decision to abandon Blue Chip. “It was not just sinking a boat. I lost my child,” says Ramsden. When Fuji Bay arrived, the seas were about 16 feet, estimates Ezell. Fuji Bay had to make several passes. On the fourth or fifth pass, Ezell says, he and Ramsden were able to capture a line and eventually board using a Jacob’s ladder. She was able to scramble up the side, and Ezell followed. About a third of the way up, though, Ezell says he found the sea anchor line from the raft was wrapped around his foot. He was yanked back and fell into the raft. The Fuji Bay crew assisted Ezell in time. “They dropped me a tether line to tie on and one of the crew assisted me,” he says. Capt. 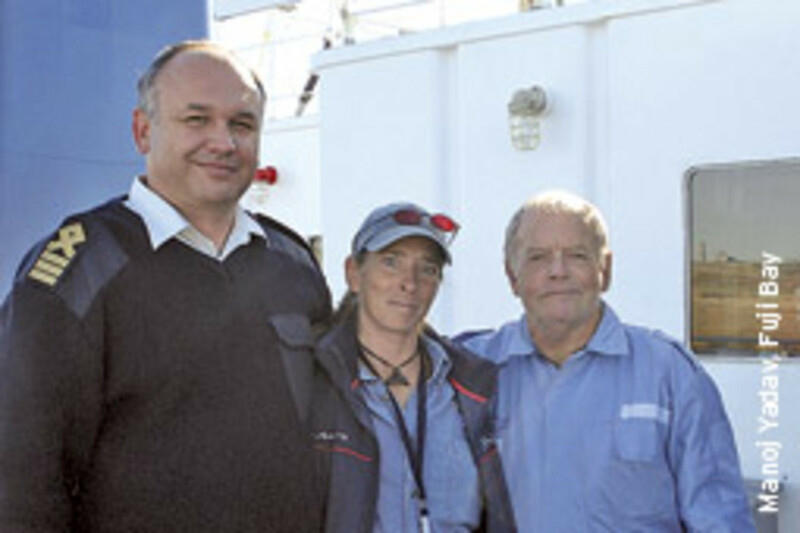 Vitaliy Tkalich and his team welcomed the exhausted pair aboard. With the rescued crew of Blue Chip safe aboard, the refrigerator vessel continued on to Wilmington, Del., with its cargo of produce on board. The Blue Chip has not been spotted since and is presumed sunk. Though both the boat and Zodiac had been inspected pre-launch, nothing was found at the time that indicated the problems they would encounter, she says. Neither sailor is deterred by the adventure. Ezell continues in the business of surveys and deliveries and says his services remain available (ezsail@hotmail.com). In late summer, he had just returned from a delivery to Venezuela.